FREEDOMFLEX® seems complicated & complex. Why? First of all, there is no other product in the market place like FREEDOMFLEX®, so agents and managers are not familiar with it. Second, they try to compare it with what they know and that makes it difficult. Third, the third and fourth components of FREEDOMFLEX® have unlimited options for the policyholder. Fourth, the product is such that the writing agent can choose how he designs his commissions and underwriting at the same time. Last but not least, you have to learn how to sell FREEDOMFLEX®. You cannot sell it like you do other insurance products. The life insurance component seems expensive. Why? The life insurance chassis that FREEDOMFLEX® is built on, a modified term to 100 chassis, has a 10th year option which allows the client to stop all life insurance coverage or modify it. Because agents are not familiar with this structure they try to compare it to a 10 tear term policy. That’s like comparing a banana split with a tea spoon of plain vanilla ice cream. If would be more realistic to compare the cost per thousand to a whole life or fully targeted UL policy. This way it is like comparing banana split to a table spoon of ice cream made up of vanilla & chocolate. Why does FREEDOMFLEX® have more paperwork than other products? Its uniqueness and flexibility requires more disclosure by the State Departments of Insurance. In addition, most of the paperwork requires just a signature and short explanation, therefore creating the illusion that there is a lot more paperwork. How can I sell FREEDOMFLEX® without a securities license? FREEDOMFLEX® is a product/service. The option or right of the client to redirect their growth side money to a mutual fund or other registered security type account does not involve the agent. This is facilitated by ISM Administrators in the second year through an option letter and a choice made by the policyholder. What is the FREEDOMFLEX® guaranteed interest rate and how can the company guarantee such a high rate in this economic climate? The Flexible Premium Annuity Rider (FPAR) pays a minimum guaranteed rate of 2% APR. This is compounded daily and credited monthly. A portion of the profits on the FREEDOMFLEX® is reinvested in the company which helps to maintain the 2% guarantee (current 3%) rate. The average rate on the FPAR over the last 13 years has been approximately 5.5% with our present carrier. It has averaged approximately 8% since 1988, that’s 24 years. Why don’t other companies sell FREEDOMFLEX®? Several other companies tried to copy us in the early 1990s, but they did not make it. Most companies were not willing to do what it takes to sell and administer FREEDOMFLEX® properly. The actuarial design is very different from other life products. It takes longer to make a profit and it requires a substantial investment to get started. 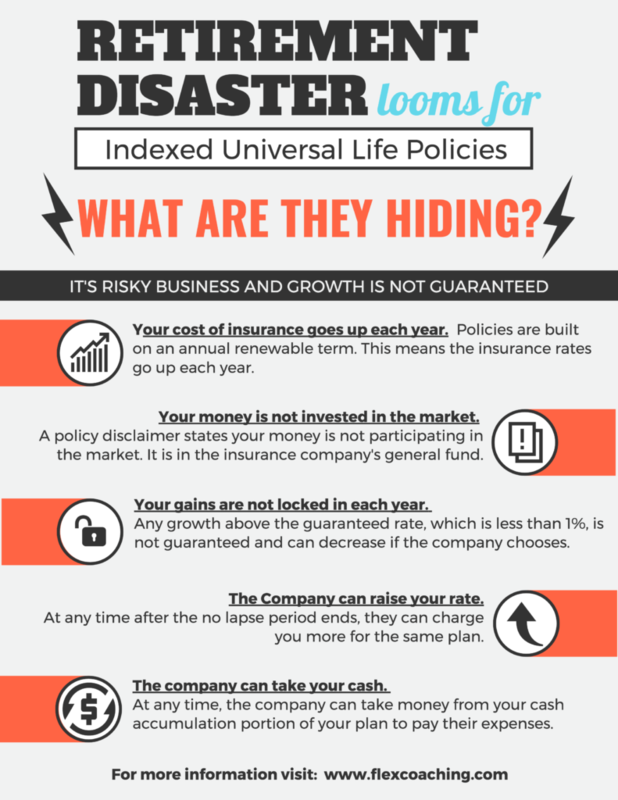 In an IUL… Are You Protected?